I asked the front desk to call me a ‘radio’ taxi and asked a porter to help me with my luggage. The porter, Jeremy, is someone I have come to know during my stay in Buenos Aries. He is such a kind, helpful, very tall, black gentleman with a British accent. Jeremy has helped me interpret the language many times. I even took a picture of a protest across from where I was having lunch at the obelisk. I took it back to him to see if it was safe. He read the protest signs and said it was safe. The protest was about bringing more awareness to mental health disorders. I went back and joined the demonstration. Jeremy and the other staff always greeted me when I arrived back at the hotel from one of my solo excursions. Most of the other conference attendees had departed two days ago. It is so much quieter now. I am so glad I took some extra time to stay and experience Buenos Aries, Tigris, and even Montevideo, Uruguay. This trip had been such an experience in so many ways. I have learned a lot about mental health, other cultures, connecting with other peoples, and my Self. I experienced such a variety of emotions, intense fear, peace, excitement, and bewilderment. I really began to be so conscious of the now. I don’t know if it was because I was so out of place in a strange country, my experience with the fear I experienced on my first day or really reviewing and remember my events so I could continue my process of writing my blog of my experiences here. It was like I was forced to pay attention to my surroundings and intuition. At home it seems like I am always going from one activity to another. I saw a tweet from someone who was describing what she was eating or not eating throughout the day. It was clear she was in the grips of her eating disorder. It brought me back to how life used to be when I too was consumed with the thoughts of food, weight, diets, body image or exercise. I can now use that awareness to enter into the world of my patients. I ask about how much time they spending thinking about these things, engaging in the behaviors and recovering from the many episodes of disordered eating. I remember the journals I kept at that time. It consisted of the date, what I ate, what time, the calories, carbohydrates, and fat content of each morsel that entered my mouth. Tell me I wasn’t obsessed. Then there were days that I binged and I would put an X through the day and record how many times I purged usually with a + sign after the number because I lost count. I went into the eating disorder world of numbness and avoided all my feelings, friends, activities and thoughts that just took too many coping tools that I did not posses. I lived a life in eating disorder behaviors or trying to avoid succumbing to the disorder. Either way the eating disorder was what made up my reality of living then. Here in Argentina my daily meditations seemed to bring me more peace than at home. But here I can reflect and kept making that conscious contact with my God all day long. It was like I had a partner everywhere I went. Here I have time to write, to connect with my Self and be prepared for whatever my adventure would be for the day. I hope I continue my pace and awareness when I come home to my everyday life. I believe I would have so much to offer from this place of stillness. Before getting into the taxi I asked the doorman to take a picture of the “radio” taxi, driver and Jeremy. 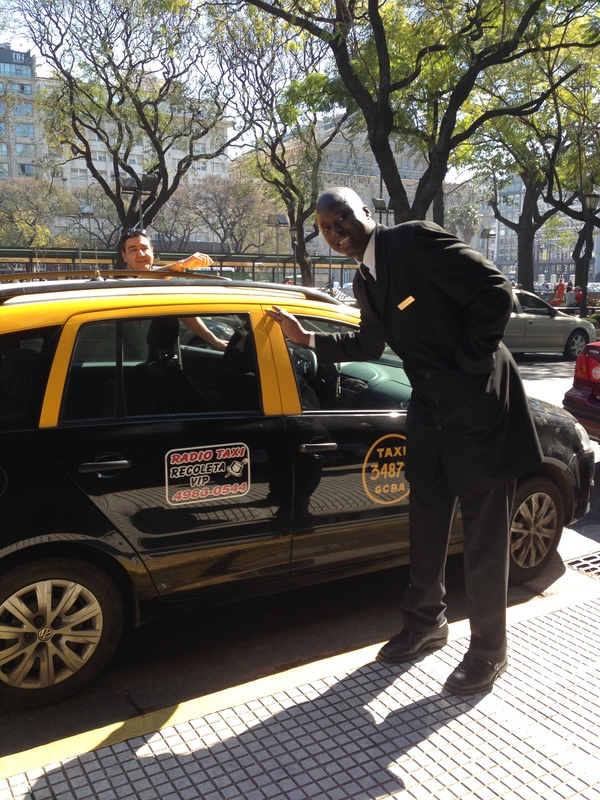 I wanted a picture of the right kind of taxi to get in Argentina to show my friends in contrast to the one I originally took. I need to admit that it also felt comforting to have the identity of the driver recorded on my cell phone that I could blast out to the world if things went awry again. I don’t know how that would really help but that was my insurance. I also did not want to forget the kindness I experienced from the staff at the Panamericano Hotel. I am sure I was a pain at times getting them to verify safety and translations. As we drove away the staff waved goodbye. It is amazing how such a small gesture can mean so much. Carlos made his way to the highway through the traffic of the bustling city. It was a beautiful day. Although the seasons in Argentina are exactly the opposite time of the year than they are in the United States this was a beautiful winter day in the low 70s with a clear blue sky. Carlos did not speak English so we were driving in silence as he listened to his music and I enjoyed the passing scenery. I could barely hear the music but I loved the melody and the beat. I pointed to the music and gestured for him to turn it up. He smiled and obliged. Half of the songs were in English and half were in Spanish. We both were tapping to the beat. I realized what a great experience this taxi ride was right now as he sang along with the Spanish songs and because the radio was very loud, I sang along to the English melodies. Anyone who has heard me sing knows that the music needs to be very loud. As an adolescent my sister, Rhonda who sat next to me in church would whisper in my ear not to sing so loud because I was embarrassing her. I learned at an early age that singing is not one of my gifts. Sometimes I will sing even worse than normal in the car with my husband or her just to be funny. Carlos would glance back and smile. We were both rocking out to the same tunes and we did not understand each other’s languages. Music truly is the common denominator. At the airport, as I got out of the taxi, Carlos ejected the CD he had made himself and placed it in my hand. The music would be a great reminder of Buenos Aires and a simple experience that was so memorable. I am so glad that I did not allow the first taxi ride from the airport prevent me from having the experience that I had just had. What a beautiful gesture! I sat on the plane reflecting on my 9 days in Argentina. I felt joy and gratefulness for the journey that I had experienced. I also really experienced a longing to write again. I had been writing because it was required of me, but I realized in that moment that the information was coming from my intellect. My recent articles were about creating awareness for eating disorders, disordered eating, food addictions and my treatment center, Rebecca’s House Eating Disorder Treatment Programs in Southern California. The writing came from a place of helping people but it was missing one key ingredient . . . me. I had totally separated from my Self and that still small voice inside. I was listening to what others told me to write and when to write. It was beginning to feel like a chore instead of the truths that came to mind when I was following my inner direction. I know we need to cooperate with others, but I was forsaking my Self for what others were wanting from me. It was no one’s fault but my own. I hadn’t even seen it until I got some distance from my ordinary life. It was such an honor to be able to talk to so many mental health professionals around the world in Argentina. Before I left, my husband told me to be very careful in South America. He was afraid someone would kidnap me and hold me for ransom. I think he has seen too many movies with that theme, but it did register in the back of my mind. In fact when I was in a few of these predicaments, the thought, “This could make a great movie script” did cross my mind. Three hours later we docked in Montevideo. Now surely I will find my tour. I frantically looked for tour signs but again there were none. I showed a uniformed man my ticket. He pointed to a bus. Again no one spoke English around me, but there was a tour director who described everything in three different languages and one of the languages was English. People got off and on the bus at different locations. I was given a schedule of pick ups and where the stops were. I finally got off the bus two stops before the arrival back at the docks. This brought back memories of when I was a child living with my grandmother in Huntington, West Virginia. My sister, Rhonda and I had gone to live with my grandparents when I was 6 years old and Rhonda was four. I was about 14 years old when I learned I could walk about one-half mile to a bus stop. I bought a token that I could use all day. I would get on one bus after another with no clear destination in mind. I was on an adventure! Sometimes I would drag my little sister with me but she didn’t seem to enjoy it as much as I did. We always found our way back home to our stop. What possessed me with this spirit of adventure even then? I remember once my sister, a couple of friends, and me was trekking along the banks of the Ohio River and came upon an old canoe. I was always the leader of these excursions and suggested we take the canoe out on the Ohio river. We got a few feet from shore and the canoe started filling with water. Everyone jumped out of the boat and started making their way back to shore, but not me. I said, ”I am the captain of this ship and I will go down with it.” I forgot to mention that I could not swim. The current in the Ohio River can be pretty swift. The canoe sank and I was able to dog paddle back to shore. I would take my sister on hikes up in the hills beside our house. My grandparents lived with the Ohio River on one side and forested hills on the other. It was a great neighborhood. I didn’t know at the time, but we were very poor. There were other people across the street that had bigger more beautiful homes, but it did not seem to matter much where you lived, at least not in my eyes. Some of my friends lived there and some had small houses like we did. On these hikes there were times when we would come upon a snake or fall off a cliff, but for the most part we just enjoyed the beauty of the mountains. There was a meadow that was so beautiful in the spring when it would turn into a field of flowers. There was a big rock just at the opening of the meadow. Rhonda and I would sit on that rock enjoying the warmth of the rock and the sun and talk about how pretty it was. There were no houses within miles. We had packed our lunch and would eat it there sometimes. We would be gone all day, but always made it back home before nightfall. During my stop in Montevideo, I though I should get some money exchanged. I found an exchange place and gave the guy sixty US dollars. He gave me pesos. I didn’t realize it at the time but these pesos were a little different then the pesos I had been getting in Argentina. Since I was able to put my lunch on a credit card I didn’t use my pesos. Later when I got back to the hotel no one would accept these pesos. They were Uruguay pesos, not Argentina pesos. I was told that it would better to get the peso exchanged at the international airport. I did remember to do this at the Atlanta airport were I went through customs for my arrival back to the states. They told me the pesos were worth six-teen dollars. I asked, “How could that be because I had exchanged the pesos for sixty dollars.” He said’ “You got taken.” I still have the Uruguay pesos if anyone is interested. At 7:30pm I got back on the ship to Argentina. I wondered how I would get back to the hotel when we landed at eleven o’clock at night. I guess the only official tour had been the bus ride around the town in Montevideo. I had given up on meeting anyone or someone directing me to the right location. I hoped I make it back to the hotel. Now I began to wonder, “What do I do now?” Should I try to find a way back to the hotel or go on the ship to Uruguay? This is one of those times I wished that Scotty would beam me up from the movie, Star Track. I wanted to dematerialize and reappear in Southern California, preferably in my own bed. My adventurous side won out. I went through customs and back to the terminal where other people were waiting. There was a little coffee area so I asked for coffee. The girl behind the counter spoke English. She understood me! I asked where should I go now and showed her my ticket. She looked at the ticket they had given me downstairs and said I should go to Pier 1. There was a long line of people getting onto a ship that actually looked like a small cruise ship. Maybe I would find my tour group on the ship and we would tour the coastline. While I was in this line of strangers a woman came up to me and asked, “Are you an America? I thought it was pretty obvious because I had my passport in my hand and I probably looked a little out of place. I said, “Yes, can I help you?” She did not know any other words in English. “What is going on?” I thought. I let her walk in front of me and kept my distance. I looked at the man behind me and he smirked shaking his head. I get it now! She was just trying to cut in line. That was fine with me. I thought she might be trying to pickpocket me. Inside the ship it looked like the inside of an airplane with big leather seats. Still there was no one with a sign to designate a tour group meeting anywhere. I sat between two elderly gentlemen at the front of the ship. I watched the sun coming up. It was really a splendid sight with orange streaks showing through the clouds. I noticed the ratio of men to women was about 10 to 1. Maybe they were going to work in Montevideo. I thought about how different it would be if I were still in my eating disorder where I could not tolerate any unpleasant feeling. I knew I was stressed and had cortisol coursing through my body. I decided to meditate. I put my sunglasses on and closed my eyes. Other people around me were either sleeping or reading. Meditation has been such a big part of my recovery. I have been meditating for almost thirty years now. Not only does it release stress, but I always feel more connected to God and on the right path for the day and it reminds me to watch for the miracles all around me. When I opened my eyes I saw no land in sight. I was beginning to wonder how far was I going? I was glad I had my paperback in my purse. I was really enjoying this book, ‘To Heaven and Back’ by Mary Neal, MD. It is about a medical doctor on an kayaking adventure in Chile where she had a terrible accident going over a waterfall and actually died. Being a skeptic about nonscientific matters she described her time in heaven. It was very much like the book I read on an earlier trip, ‘Proof of Heaven’ by Eben Alexander, MD. I applaud these professionals who are willing to reconcile neuroscience and spirituality. Both of these books are on the New York Times Bestseller list. I awoke early. I was going on another adventure. I didn’t realize it at the time, but I was actually going to another country. I was supposed to be in the lobby to meet for the tour at 6:30am. My telephone rang at 6:15. The front desk told me my ride was here. What did she mean that, “my ride was here?” The tour was supposed to meet at 6:30am in the lobby. I rushed down and the desk pointed me to a man who did not speak English. I took my tour ticket to the front desk and asked if this man was the ‘tour.’ It did not make sense to me. Where were the other people? Why would our tour guide not speak English? Juan, at the front desk said he did not know anything about a tour. There were two men in the lobby speaking to each other in Spanish who looked my way. The bellhop asked, “Are you Rebecca Cooper? This man is asking for you.” I asked the bellhop if he would translate. I asked, “Is there anyone else going on the tour? It is only 6:25am and we are not even suppose to meet till 6:30.” The bellhop and man communicated some more and I was told I was the only one going. The tours I signed up for months ago were advertised with the conference I was attending in Argentina. There were 5000+ people attending this conference and I was the only one going on a tour? We drove along a disserted street where all the stores had their iron garage doors shut over the storefronts. There was trash in the streets and a few people milling around. It looked familiar; like the place where the taxi driver took me to steal my money. Up ahead I saw blue flashing lights. Later I noticed that all the police cars have their blue flashing lights on all the time, not just when there is something wrong. My first thought was, “Should I jump out and get into the police car?” The taxi pulled up behind the police car at the red light and the police car drove through the red light. The driver finally stopped at the shipping docks. I asked, “Where do I go?” He kept waving towards a door to the left of me. I was glad to get out of this car, but where was I going now? I had imagined being on a tour with other mental health professionals from around the world getting to know each other and listening to a Translator, who also interpreted in English, about the sights we were seeing. I entered a huge terminal for ships with long lines of people waiting their turn at the windows. Now what? I had hoped there would be someone there with a sign with the name of the tour company or my name. But no, no one was looking for me and there were no tour signs in sight. All I had was a ticket that had been emailed to me. No one there knew what the ticket was for. No one around me in line understood English. I got to the window and they kept asking for my ticket. This one didn’t seem to be the right one. An English man standing in another line came to the window at that time. He heard me trying to make sense of all this. After he finished his transaction he came to me and looked at my ticket. He said, “This ticket says ‘flight,’ was I suppose to be flying to Montevideo?” I hadn’t a clue. This was not like any tour I had ever been on. The ticket agent took my passport to her supervisor. I could see them talking. They looked up my reservation with my passport number and yes I was in the right place. I was taking a boat to Uruguay and I needed to go to the immigrations office and go through customs. What?